A bit of inspiration from the WedEclectic Team… a la Purple. It can be a stunning color to include in your wedding, using a myriad of shades, or a black tie affair with a single color accent. Here’s a few items to consider including in your purple wedding! Check out this fun team treasury by Dalynda from SteampunkWedding! 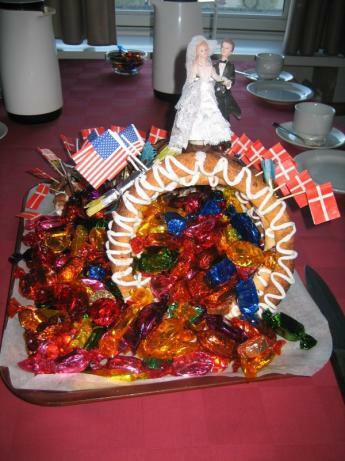 Scandinavian Wedding Cakes…also Gluten Free! 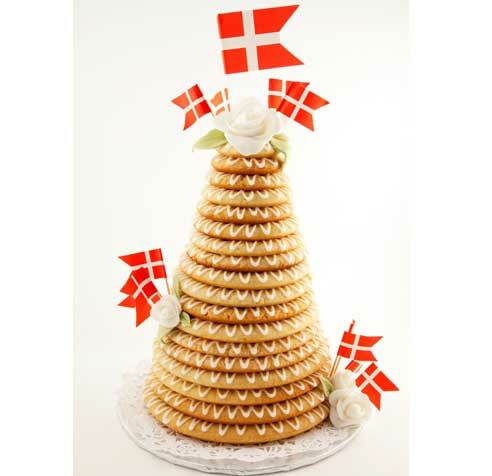 If you are looking for a wedding cake that is a little different from the norm or you or your intended are gluten intolerant, the Scandinavian KRANSEKAGE may be what you are looking for. This picture came from Food.com. The kransekage can be made from purchased almond paste which is easiest…and can also be made from almonds that you grind. A fun cake to make and a delicious cake to eat! Clay Bouquet Shop is offering a $25 gift certificate to her shop! vibrant colors to choose from, it promises a colorful 2014…Bright! Vivacious! Brilliant! Electric! There are a lot of choices this year…but in the end, it still means that you get to choose exactly what you want in color and style…and what is great about the Eclectic Wedding team is that this professional group of individuals are able to create the wedding of your dreams in all areas . . . from the invitations to the gown, shoes, headpiece, jewelry, flowers, reception…there is someone here who can do just what you need. 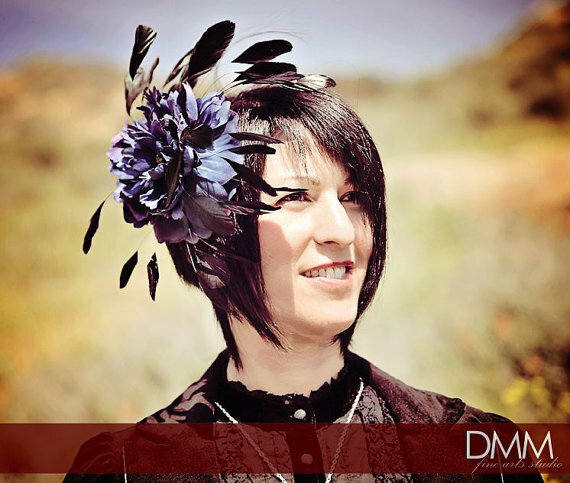 Kelly creates floral crowns, hair flowers, jewelry, and more! An array of her floral crowns…a great veil alternative for the bride! And fascinators, for the bride who wants something different! And a few of her fabulous hair flowers…perfect for the Bride, the bridal party, and just for fun! A pair of Feather Bullet Earrings, worth $20! A Dia de los Muertos Skull Fascinator, worth $22.50! Prizes will need to be claimed within 2 weeks of winning! This giveaway will run until midnight, January 31st (extra long due to the holidays! ), but don’t wait! Commenting, including your favorite item from MsFormaldeyde‘s shop. Commenting that you hearted MsFormaldeyde‘s Etsy shop (and your Etsy name for verification). Commenting that you friended MsFormaldeyde on Facebook (and your FB page for verification). Tweeted this giveaway (please copy your tweet here). Posted this giveaway on your Facebook page (please copy your post here). Posted this giveaway on your blog (please include the link here). Posted this giveaway on a wedding/social network (please include the link here). The winners will be chosen randomly, verified, and contacted on February 1st via email with the good news! Congratulations – you’re engaged!! Here are some wonderful cards to thank your guests after your engagement party or bridal shower. All are handmade and customizable from shops on Etsy. Two of them are pdf files so you can print out however many you need for yourself. Clicking on each photo will open a new tab to that shop’s listing for information about each item. Centuries ago, the brides would carry an aromatic bunch of garlic, fruit blossoms, herbs and grains(dill and marigold could be eaten at the wedding feast to promote desire). These bouquets were meant to drive away any evil spirits and symbolize prosperity. During the Victorian times, flowers became more prevalent in the bouquets as well as the specific meanings that were given to the flowers. When comprised of blooms, it symbolized the bride’s status as a “maid in bloom”. A wedding would mean good fortune, and at one point(approximately 14th century, the guests would begin to try and tear away pieces of the bride’s clothing and flowers in order to obtain this fortune. In an attempt to deter the guests from doing this, both the bouquet toss and the garter toss originated. The garter is thought to represent the virginal girdle…when the groom removed the girdle, it demonstrated publicly that the bride was relinquishing her virginal status. a. The traditional one where all unmarried women gather and the bouquet is tossed. b. All of the women. d. Give to someone specifically, for example, a newly engaged friend. e. For the longest married couple. f. Dedicate the bouquet in honor of a loved one who as passed. The garter is thought to represent the virginal girdle…when the groom removed the girdle, it demonstrated publicly that the bride was relinquishing her virginal status. The garter can be part of the “something blue” to protect the bride against bad luck or unhappiness. This may come from the “Order of the Garter” which is one of the oldest orders of knighthood and symbolized by a blue ribbon. Knights were known to be the protectors of women. The mantle of a Knight of the Garter was worn by royal bridegrooms over their wedding attire. The groom throws the garter and the traditional meaning is that the one who catches it will marry soon. In many weddings, the man who catches the garter and the woman who catches the bouquet will be the next two people who will get married(not to each other). The garter toss in past times was proof that the marriage was consummated and it was considered good luck for the man who caught the garter. For your wedding day, knowing that you can incorporate your own version of a toss bouquet…whether to toss it or to dedicate it to someone….will make your day very meaningful. The garter toss can be as demure or as sassy as you and your groom desire! 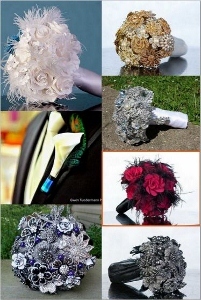 Check out the many shops of WedEclectic Members for toss bouquets and garters. I love the Fall. Of course I love the colors, and the endless social gatherings, but the food is the real reason that I look forward to this time of year. Homemade apple crisp, eggnog lattes, Irish cream, and pumpkin everything. It’s when I really get excited about baking. I learned to cook from some amazing women. And everything was made from scratch. So recently, when my mother came to a complete standstill over the fact that I didn’t have the Pumpkin Spice Mix that she needed for her recipe, I was floored. She could not figure out how to make her dessert without my help, and I loved every minute of it. For those of you who rely on the Pumpkin Spice Mix as my mother now does, here is the breakdown. And if you ever find yourself in my mother’s predicament, I hope your daughter is more understanding than I was. 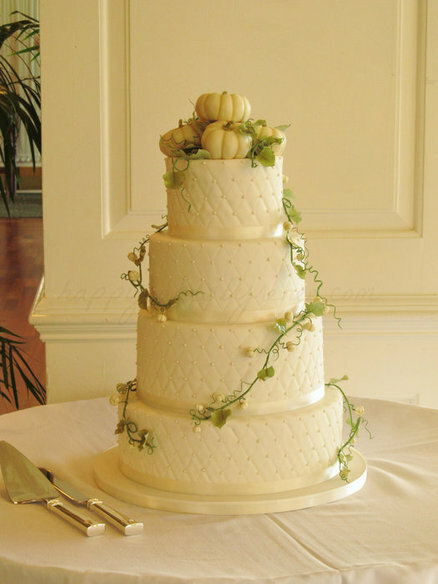 For all of you brides who happen to be have Pumpkin Spice Mix on hand, here are some really cute, and very creative ways you can incorporate it into your wedding. I think these are fabulous favors. You can place these instructions on the back of the tag: Add some spice to your life! Stir 2 tbs of cappuccino mix into 1 cup hot water/milk and enjoy! You could personalize these bags by adding a custom tag or label with your wedding information (names and wedding date). Okay, this one is just because I’m hungry. But these are so cute, bite size, no mess, and very Fall’ish. Wouldn’t these be beautiful sitting in a tiered cupcake holder on your dessert table. What? You’re drooling? Do you need a reason better than taste approval for your big day? I think not…. Here is a 5 star recipe for the most amazing Pumpkin Spice Cake: http://www.tasteofhome.com/recipes/pumpkin-spice-cake. I recommend a cinnamon glaze to top it off. And just a little more inspiration……. Beautifully simple, and very simply beautiful.